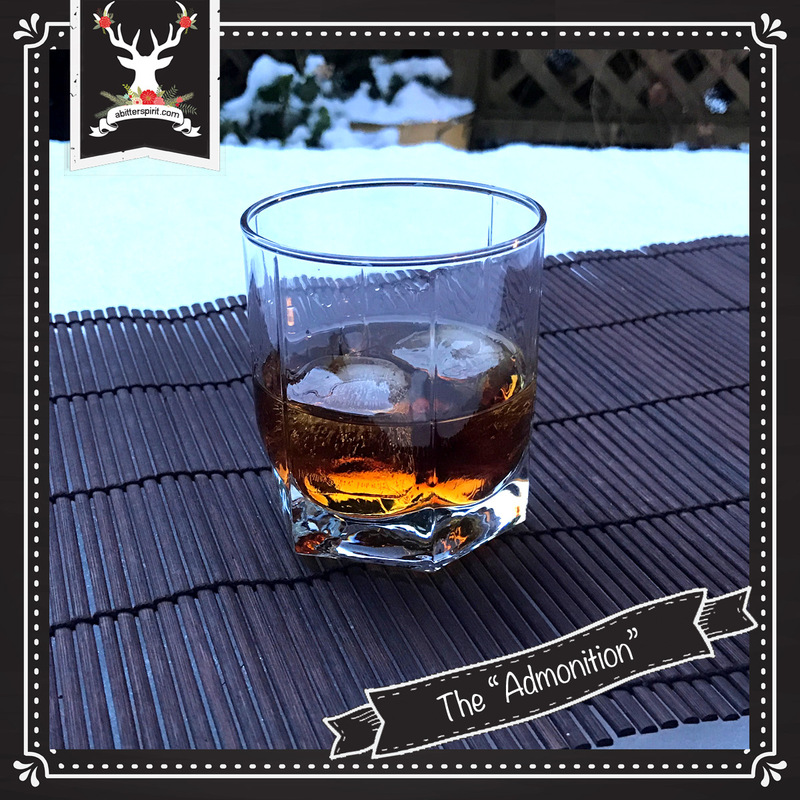 The event in the Christmas Story that we are focusing our cocktail on today is what we are terming Joseph's Admonition. Joseph figured out that Mary was pregnant with Jesus and was going to quietly divorce her. In a dream, however, an angel appeared and said to Joseph, "Hold up there, Joseph. Just calm the eff down. The kid Mary is carrying is gonna be the saviour soooo just relax and go with it." (No really. That's verbatim.) And Joseph did calm the eff down. Well, after a drink he calmed down...at least in our minds. For this cocktail, we envisioned a strong drink because after finding out that your new wife is pregnant with the son of god, you're gonna need a DRINK. So we started first with a manly drink, a Manhattan with Maker's Mark for the bourbon. We then added a touch of Art in the Age's Root to give it some bitterness and some complexity and a little Galliano to give some sweetness and accent the vanilla notes. The result is a taste reminiscent of horehound candy, perfect for a guy who's basically been told, "Shut up and take your medicine." Combine ingredients except for bitters in shaker. Shake over ice. Pour over rocks in a rocks glass. Swirl in 2 dashes of Peychauds. This went really smoothly. 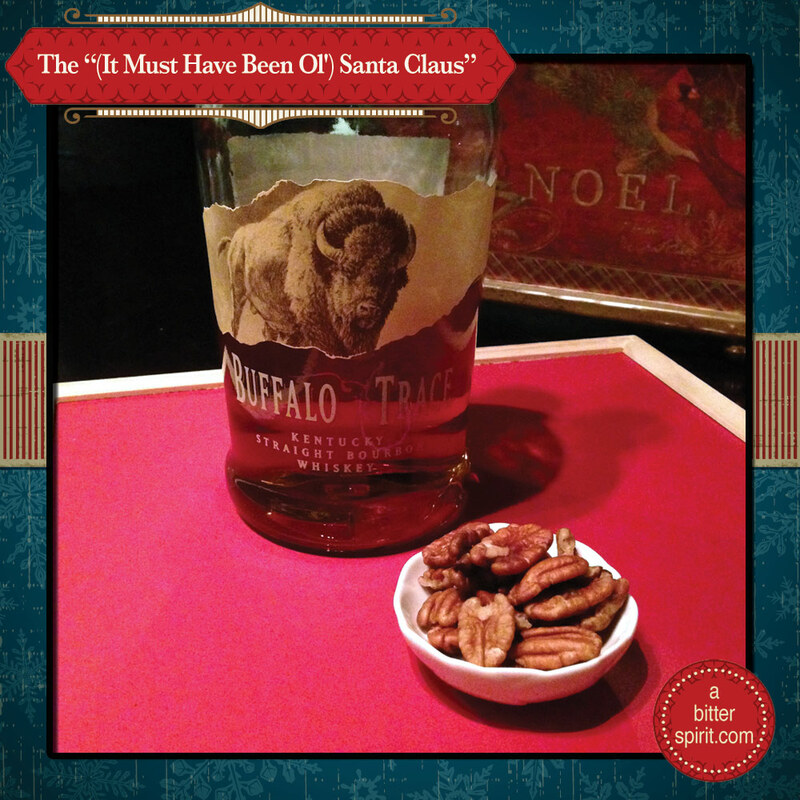 We started with Buffalo Trace bourbon, but it wasn't bite-y enough. So we switched to Makers. Done. Thanks, Joseph. With today's cocktail, we say goodbye to the Solstice cocktails and start a group that we're calling the Christmas Story Events. 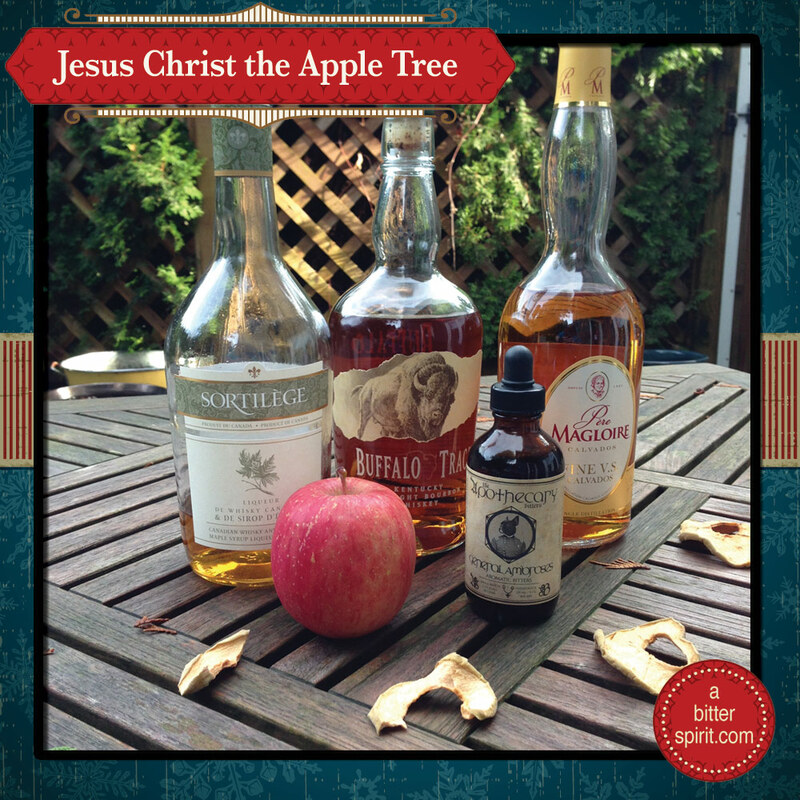 Basically, we chose a few significant events around Jesus's birth, and we're making a drink to celebrate it. (Drew - We might be a little buzzed from some cocktail testing so if some of this post is slightly incoherent, we're hoping you'll forgive us. #RealTalk | Kate - we did not choose the shepherds). 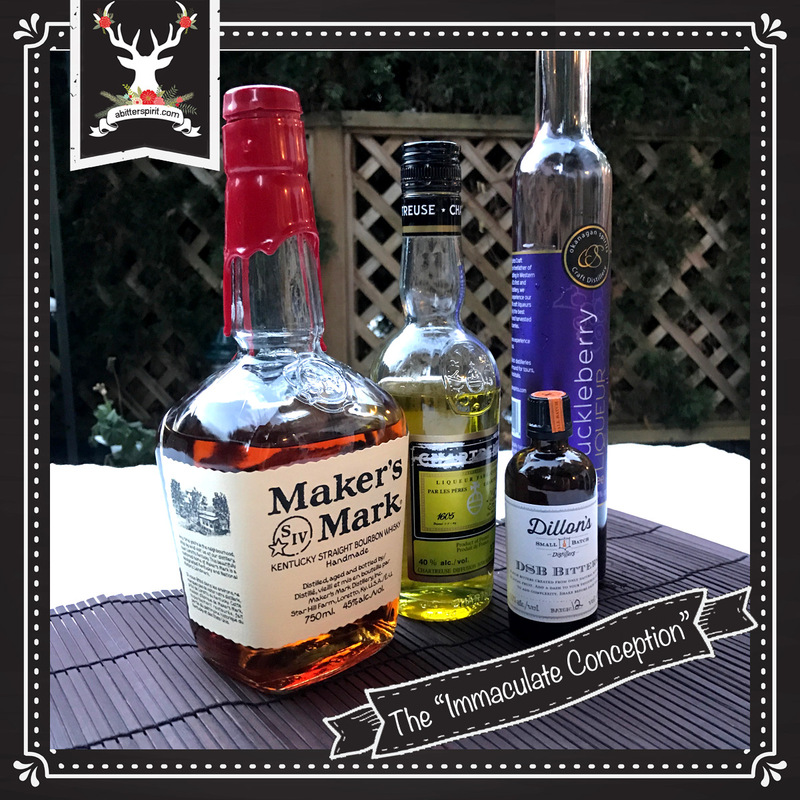 Today's cocktail focuses on the story of the Immaculate Conception. Many people think that the Immaculate Conception refers to Jesus's virgin birth. Not so! The Immaculate Conception refers to Mary being born without Original Sin. So according to the Bible (well, Catholic tradition), St. Anne and St. Joachim (Mary's parents) totally did it and Mary was the fruit of that union, she was born a pure (sans sin) vessel and could therefore, later in her life, carry and bear the Messiah. For this drink, we decided we wanted something boozy yet something lady like. Kate had in mind something similar to an American in Paris. We had several of Okanagan Spirits' Fruit Liqueurs lying around and decided to try some of those. Huckleberry seemed to work the best (and such a pretty colour!!). That, mixed with some bourbon and yellow Chartreuse made a delightful sipping cocktail. Combine ingredients in a shaker. Shake over ice. Serve on the rocks in a rocks glass. Back at the beginning of December, I was chatting with our Mom and she asked "Are you doing your cocktail calendar again this year?" When I replied in the affirmative, she said "Well maybe you could make a nice punch. I'm always looking for a good punch to serve at parties." 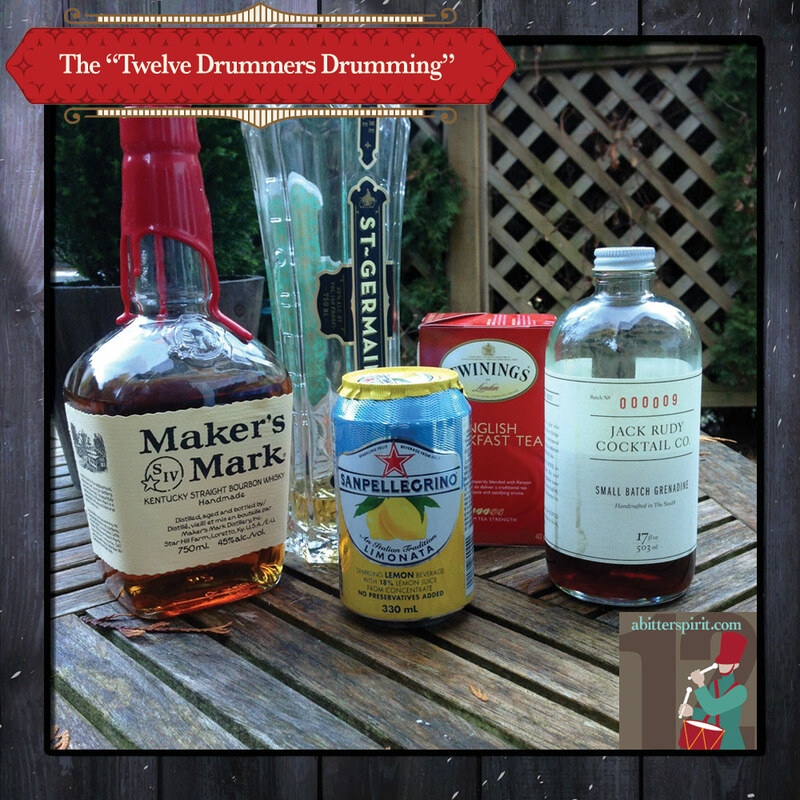 Since today is also Twelfth Night (and sadly the last day of this year's cocktail calendar), we thought that today's drink should be that nice punch! So here's one for you, Mom. You can make a glass or a batch. 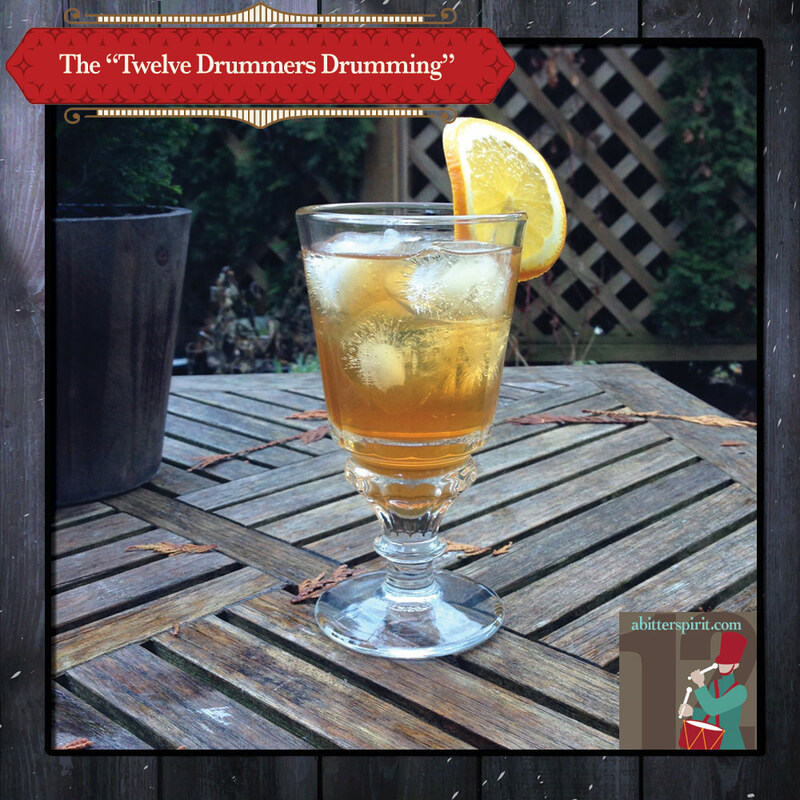 Oh .. kind of like yesterday, this drink doesn't necessarily tie into drums or drummers .. but it's Twelfth Night, so that's pretty close. Combine liquor, grenadine and tea. If you're serving by the glass, pour into individual glasses over ice and then top up with appropriate amount of Limonata. Garnish with an orange wheel and some loose pomegranate seeds. If you're serving into a punch bowl, add the Limonata just before guests arrive to keep it bubbly. To fancy it up, add an ice ring to your punch bowl! We used English Breakfast tea in this version; it was a smidge bitter. In the summer when we made bourbon slush, we used a bourbon vanilla tea; it was a little smoother and would probably work a little better. If you have some tea options, you can play around. Yep, you guessed it. THIS was our white whale. 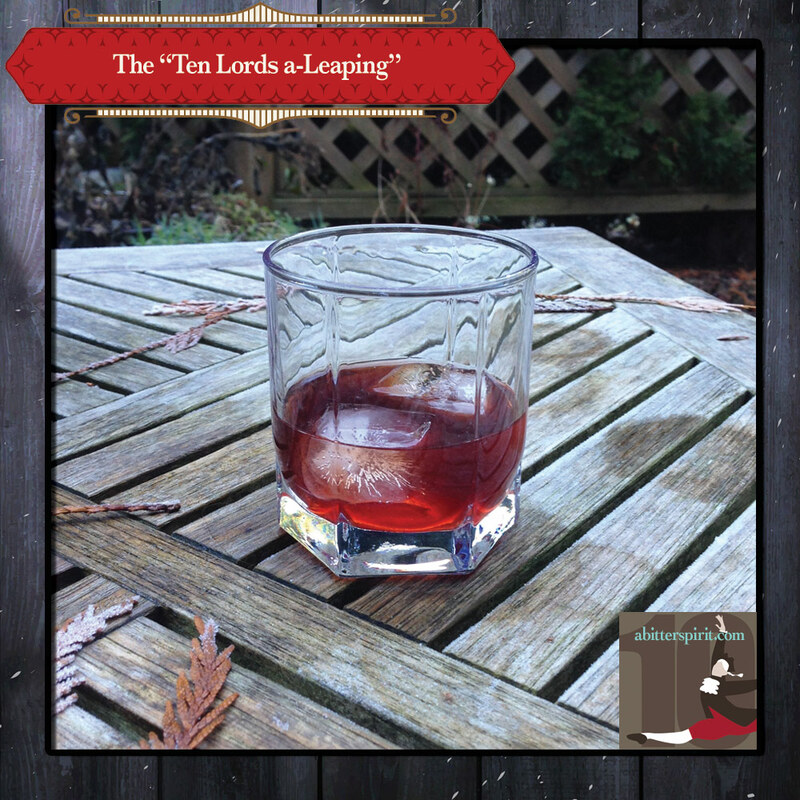 It started off simply enough .. we thought "Hey, these lords, they probably want a good stiff drink after all that leaping. Let's give them something strong and (traditionally) manly. Let's start with a Blood and Sand and go from there." Aside from the obvious appeal that the original cocktail is from a bullfighter movie (talk about leaping! ), it also uses whisky as a base. We try different booze bases to keep you, gentle reader, interested. After all, not everyone are the ardent bourbon-lovers like we are. We tried several variations and combinations of Jameson Irish Whiskey (because the only scotch we had was Kate's birthday scotch, Glenmorangie with a Sauternes finish, and she'll be damned if she's putting that in a cocktail) with Lillet (instead of the sweet vermouth), orange juice, Cherry Heering, port (see cocktail note 1), Root, Fernet Branca and cranberry sauce (see cocktail note 2). After multiple hours, we called it a day and resolved to start fresh on the 'morrow. Combine all ingredients with ice in a cocktail shaker. Shake very well. Double strain over ice into a rocks glass. Garnish with a light twist of orange. We had a guest bartender attending during our first session. Part of the time we spent trying various ingredients to see if they would go together. One that surprised us was a 1:1 Lillet/port combo. VERY smooth. Our guest bartender, Marni, dubbed it "The Tipsy Mommy". Jam cocktails are quite popular where Drew hails from (you go into a bar, choose a base spirit and a base jam, then they riff on it a bit and make you a tasty cocktail). We'd been wanting to try something like that. We had some cranberry sauce leftover from Christmas dinner, so we incorporated it. The sauce was homemade with real cranberries (hence the double straining); it also had maple syrup and Grand Mariner in it - so that may effect the taste of the cocktail, depending on what kind of cranberry sauce you use. 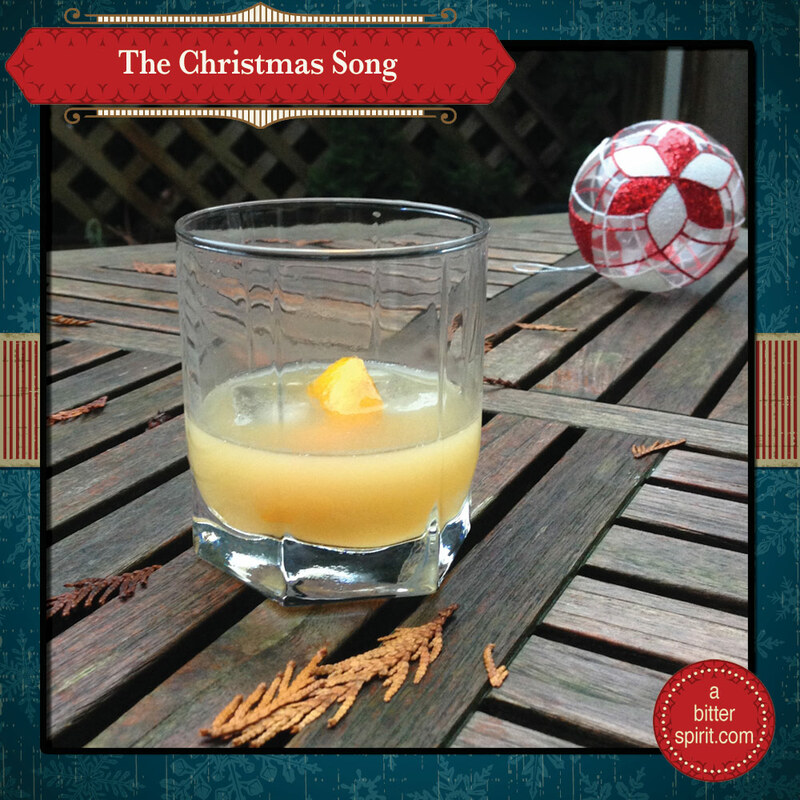 The carol inspiration for today's drink is (It Must've Been Ol') Santa Claus by Harry Connick, Jr. Recorded for his 1993 album When My Heart Finds Christmas, the song proved to be a funky and jazzy addition to the holiday repertoire. When we think of New Orleans (hometown of HCJ), one of the images that pops up is that of fresh pecans (often in pralines!). This pecan "milk" punch fits the bill. We added some southern bourbon just for good measure. Toast the pecan pieces in a skillet on the stove over medium heat until fragrant. Turn off the heat; add the cinnamon to pan and toss. After the nuts have cooled, transfer the pecans and cinnamon to a blender. Add the water, figs and vanilla. Blend until smooth. Allow to sit for 3-24 hours. Strain the mixture through a fine sieve or cheesecloth, discarding the solids. Return the liquid to the blender and add the cream of coconut and blend until thick and frothy. 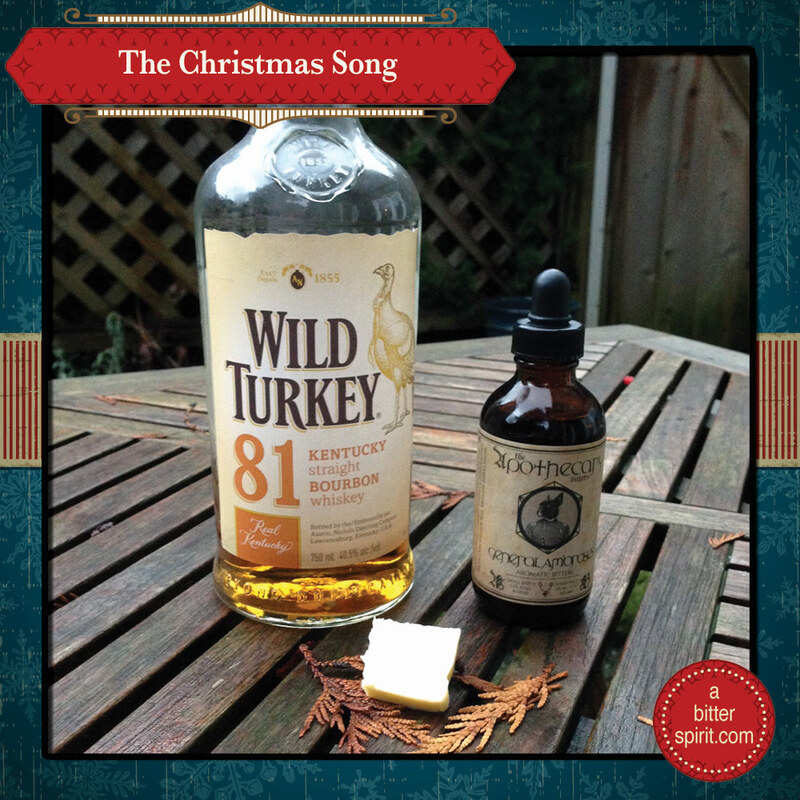 Pour mixture into glass and add bourbon (and whipped cream) if desired. We, more or less, followed this recipe for pecan bourbon punch. Pecan milk is surprisingly easy to make and there are numerous videos online that give demonstrations of making it (or other types of milk). Straining the milk through only a fine sieve will leave some of the nut particles in the milk. Nut milk bags are available for a relatively low cost (5 bucks) that provide a much finer strain. We used Buffalo Trace in the punch because, as a smoother bourbon, we thought it would allow the pecan flavour to come through. After we added it, the Trace brought out some of the bitterness in the nuts. 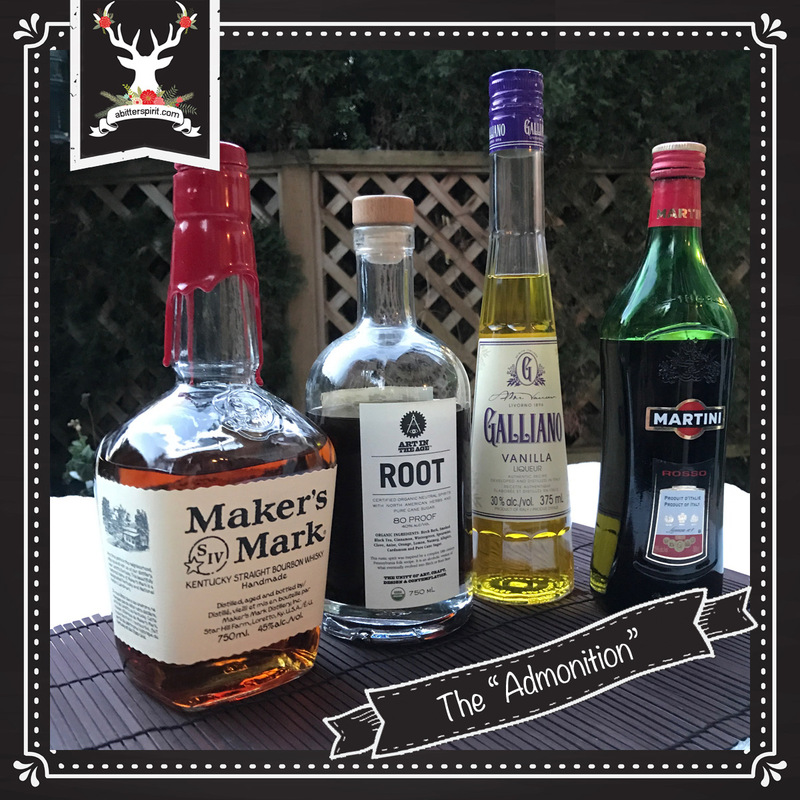 In retrospect, we might have tasted a couple of other bourbons with the pecan milk to see which one went best. 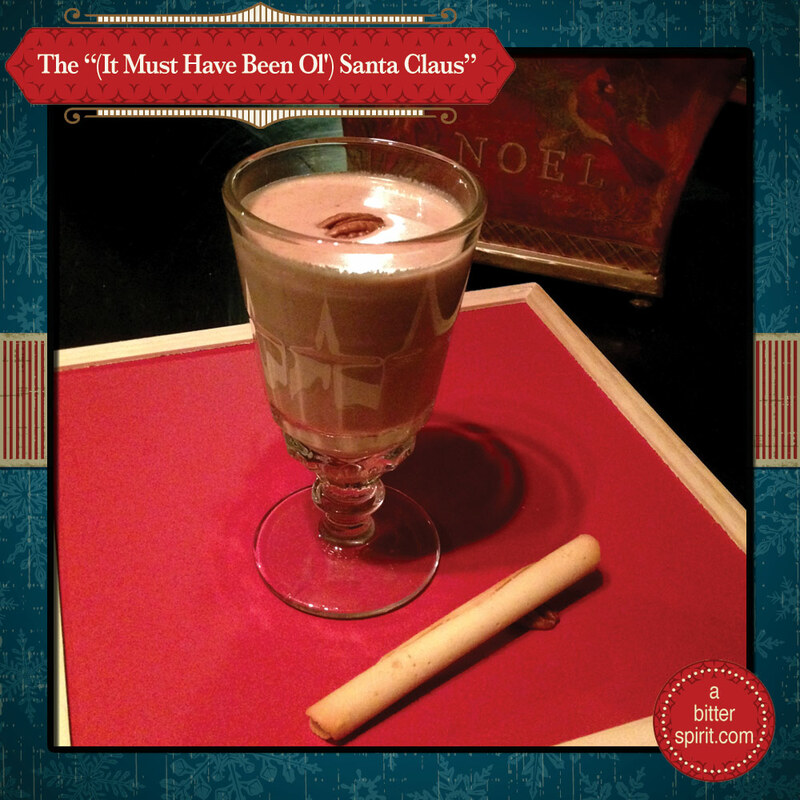 The inspiration for today's cocktail comes from the classic ballad, The Christmas Song (Chestnuts Roasting on an Open Fire). It was written in 1944 by Bob Wells and Mel Torme during a blistering hot summer. Torme recalls that Bob Wells started the lyrics by trying to think of things to help him cool off (hence the opening lines). Within about 40 minutes, one of the most iconic songs of the holiday season was created. I think someone was drinking this cocktail before we took the picture. Not much left! Kate's note to self, keep a closer eye on Drew. We'd been wanting to do a brown butter-washed bourbon .. and what could be tasty in brown butter? Chestnuts! For this cocktail, we butter washed some bourbon and made an old fashioned out of it. We did two batches of bourbon, one with chestnuts sauteed and one without. This cocktail also ushers in our final theme: Family. Because nothing makes us need a drink like family. Place all the ingredients but the orange twist into a cocktail tin with ice. Stir until chilled and pour into a rocks glass with fresh ice. 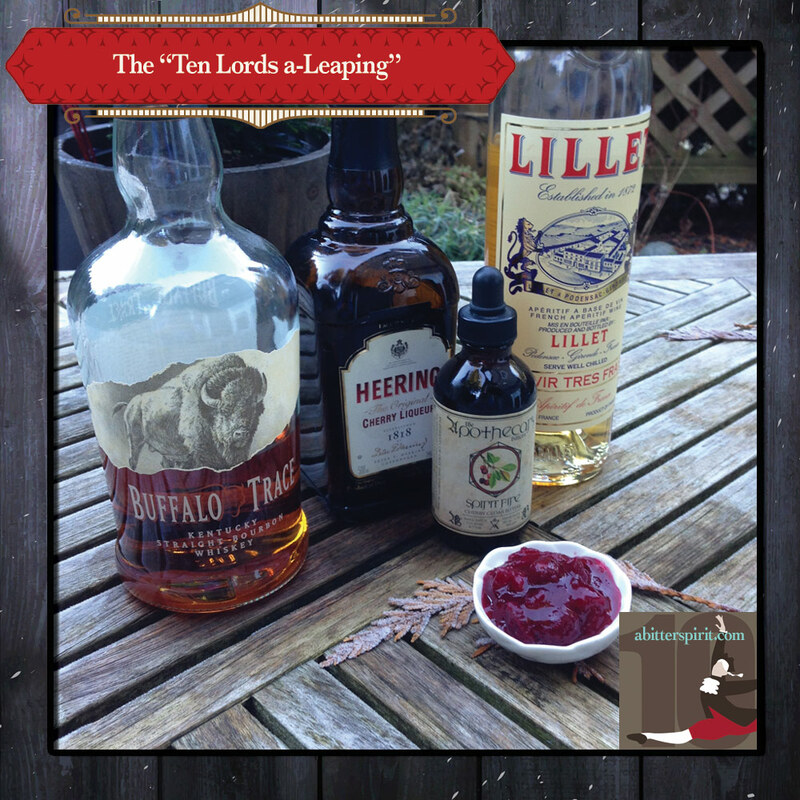 For the most part, we followed the this recipe for making the brown butter washed bourbon. The proportions seem to be about 4:1 for the bourbon and butter. Keep an eye on the butter as it can go from light brown to burnt relatively quickly. To do the chestnut brown butter, we roasted, peeled and chopped 8 chestnuts and put them into the butter as it was melting and browning. 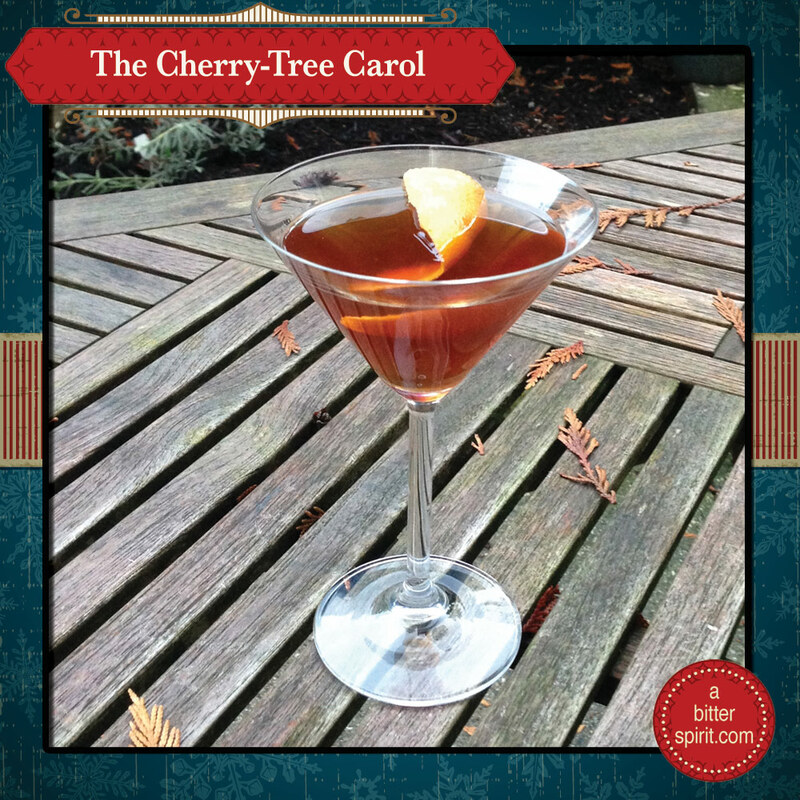 Our cocktail inspiration for today is The Cherry Tree Carol, a Child ballad based on an apocryphal story about Mary and Joseph's journey to Bethlehem. While traveling through a cherry orchard, Mary asks Joseph to pick a cherry for her. He refuses saying "get your baby daddy to pick your cherries" (we paraphrase). The in utero Baby Jesus hears his mother's request and bends a cherry tree branch down so she can reach some damn cherries. We started with a pretty straightforward idea - something cherry. But we didn't want to do just a simple cherry sour or similar. Kate got a butane torch for her birthday last month. This cocktail was calling out for some kind of fire or smoke. Let's burn some cherry wood! Combine bourbon, Benedictine and bitters in shaker. Light a pile of cherry wood chips on fire. Blow out fire when it starts to smoke. Invert cocktail glass over smoke and capture in the glass. Add ice to shaker and shake to chill. Strain into smoke filled cocktail glass. Take a slice of orange peel, express the oil over the cocktail glass and light on fire. Note: this cocktail is a little easier to assemble if you have two people. To infuse the Benedictine, we added about 1/4 cup dried cherries into about 1/2 cup Benedictine and let it infuse overnight. We also made a cherry infusion with Suze (same ratio). It was tasty, but not as good as the Benedictine. Our cocktail is a variation of one created by the good folks at Apothecary Bitters - the Gedi Prime. They use a cherry-infused vermouth and then infuse the booze with the smoke, rather than fill the glass. We like the smoke-filled glass because of the effect when you serve it. And surprisingly, the smoke stays in the glass longer than you would expect. 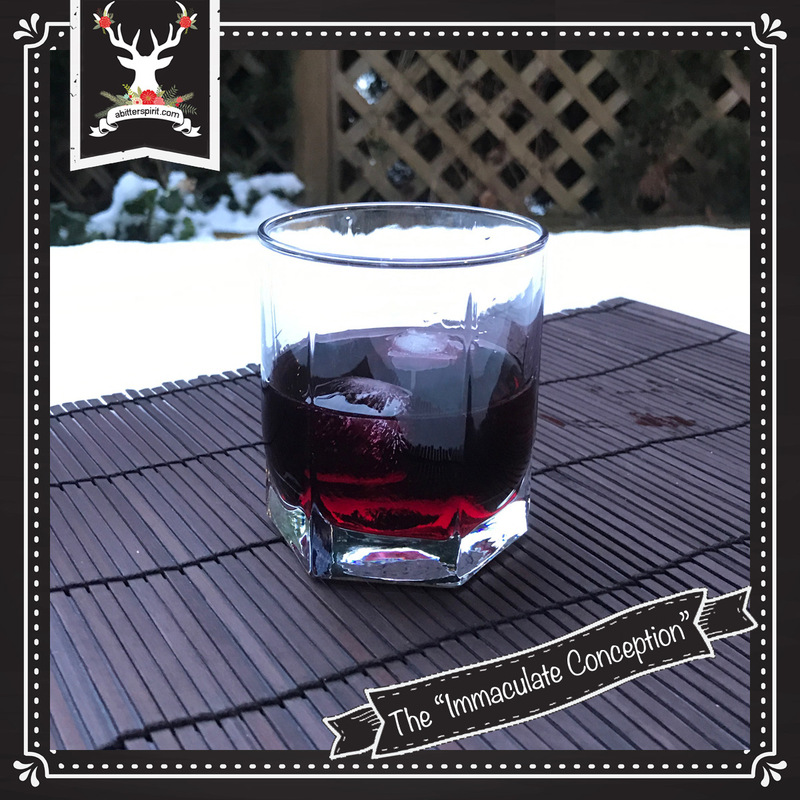 We refrigerated the cocktail for a few hours before drinking it, and the smoke could definitely still be tasted in the glass. 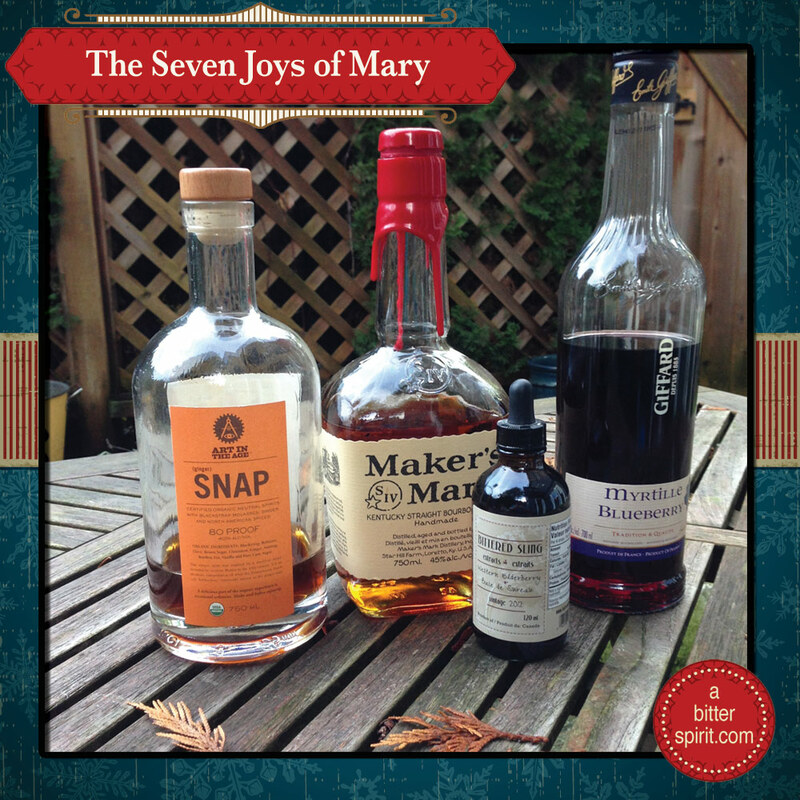 The carol for today's cocktail is The Seven Joys of Mary. Ever since Mary has been venerated in the church, the significant events in her life are portrayed in art, literature or devotional material as collections: Seven Joys, Seven Sorrows, Five Joyful Mysteries, etc. Mary was a very busy lady. This song, celebrating seven joyful events in her life, is one of many "counting songs" that have found the way into our Christmas traditions - the most famous being the Twelve Days of Christmas. One thing about Mary, even when it's supposed to be her "Seven Joys", it isn't. Because one of her joys is seeing her son crucified. Sure .. you could argue that if you look at the OUTCOME of that (from a theological perspective) it should be a joy. But c'mon, we're pretty sure she wasn't hanging out at Golgotha dancing a jig. She probably still needed a drink. And a stiff one at that. 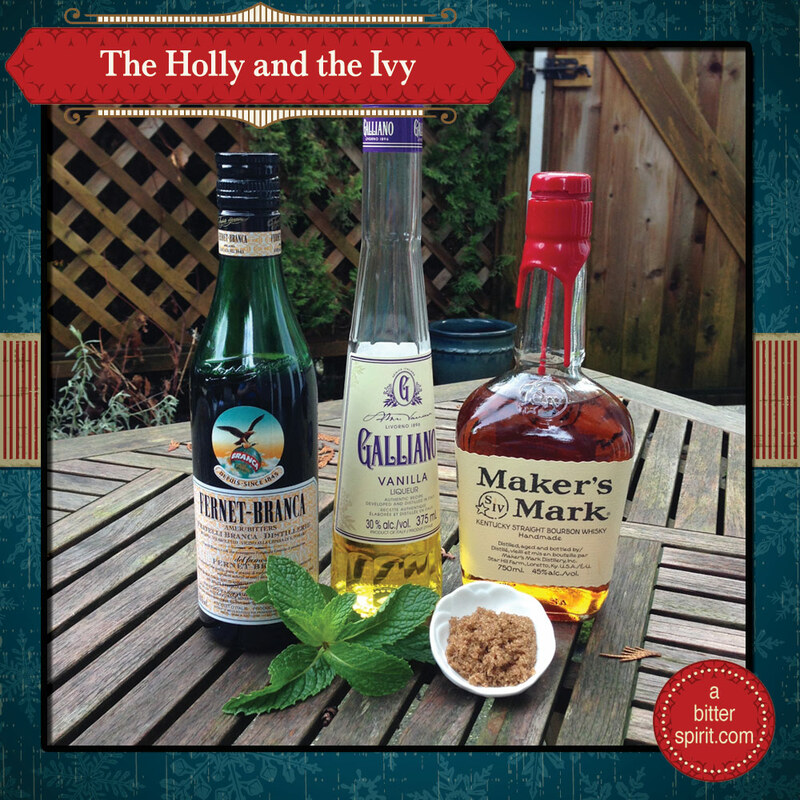 So we created a good, strong "sipping" drink for Mary. Something to drink while you're PONDERING YOUR LIFE .. joys, sorrows, or what have you. Pour all of the ingredients into a cocktail shaker and stir until chilled. Strain into a rocks glass over ice. This was originally going to be a variant of a Last Word (equal parts gin, lime, green Chartreuse and maraschino liqueur). We considered kumquat and yuzu juice substitutions. Even golden berry juice. None of them worked for us. Also, Drew felt we were relying on the Chartreuse a little too much this holiday season. So we went in a completely different direction. No more juice - just a smart, sophisticated drink for a smart, sophisticated lady. 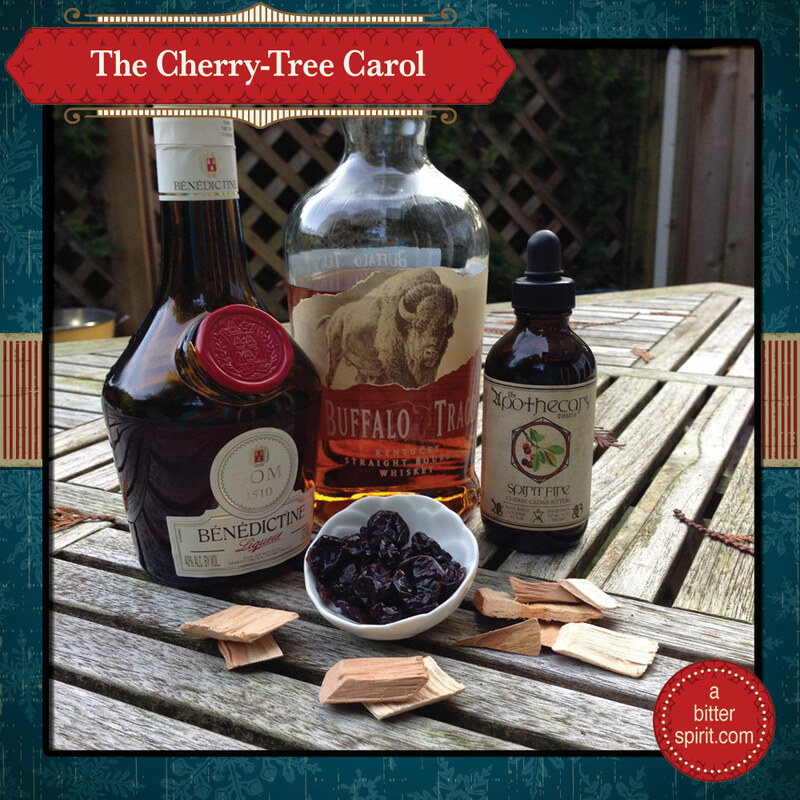 We started with bourbon as the base since it is a classic sipping liquor. 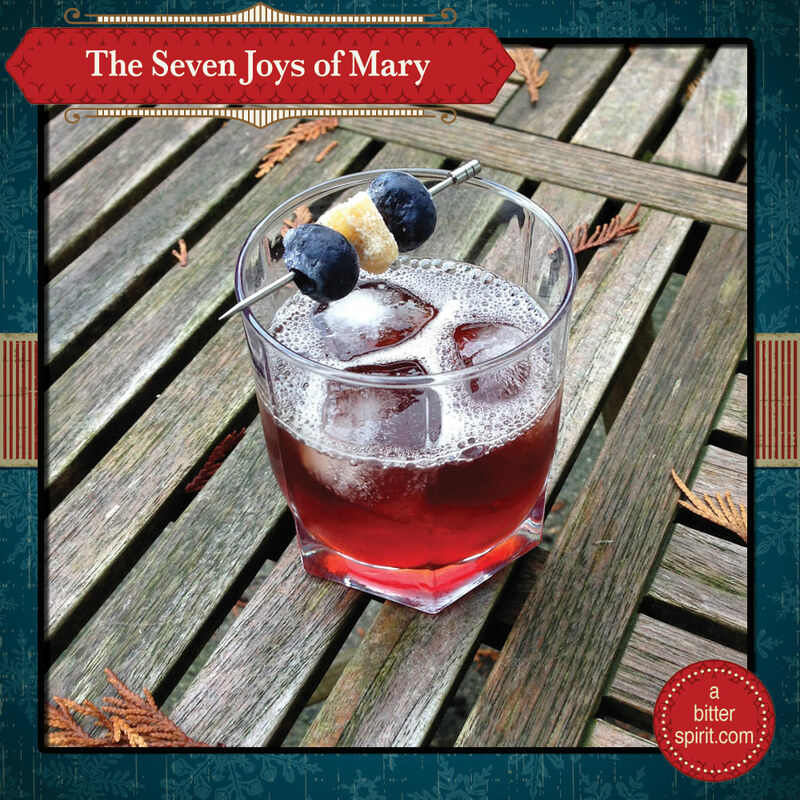 The blueberry liqueur added a slight sweetness (without relying on a simple syrup) and a dash of symbolism since Mary is generally portrayed in blue. The Snap adds the perfect finish, a touch of spiciness and warmth as well as a throwback to the region where Mary grew up. Fee Brothers Black Walnut Bitters: Has potential. Loses some of the berry taste. I love Great Big Sea's version of this. So kicky! There is a bit of an intro at the beginning; the singing starts around 50 seconds in. 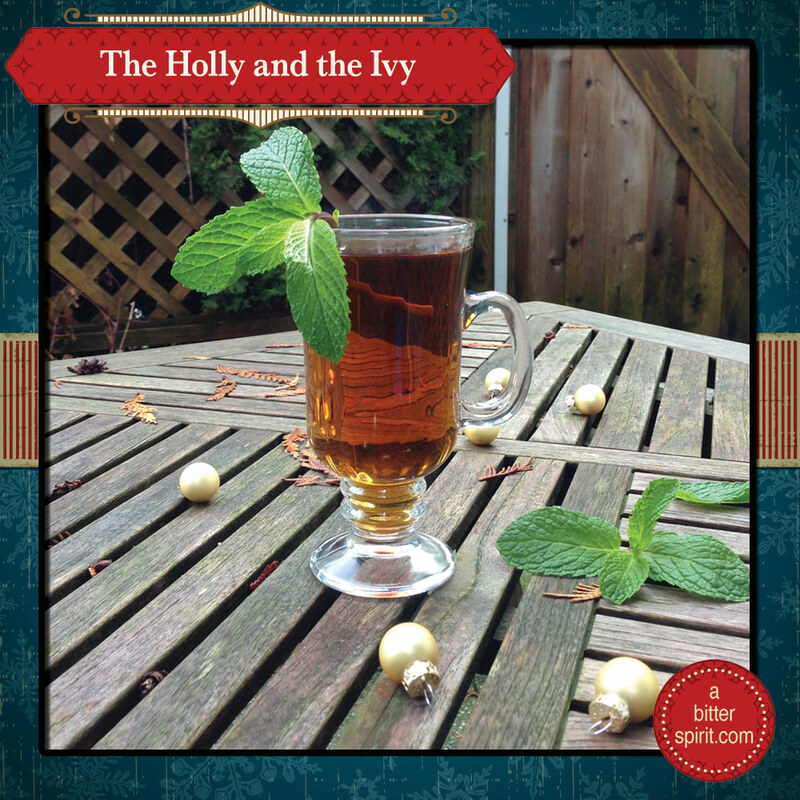 The carol for Day Eight of our calendar is the British carol, The Holly and the Ivy. Holly and ivy have played a large role in English Christmases since at least the fifteenth century. Since both plants stay green throughout the winter, they were frequently used to decorate the inside of country churches during Christmastide. When the carol was published as part of the New Oxford Book of Carols, it gained world-wide notoriety. Holly and ivy hold a large amount of cultural significance in Europe and England. The druids commonly associated holly with the winter solstice and Romans considered holly to be the sacred plant of the god Saturn. Additionally in Victorian England, men associated themselves with holly for its "masculine" qualities while women affiliated themselves with ivy because of its "feminine" qualities. At least one recorded song has a "contest" between the two plants with men and women extolling the virtues of their identified botanicals while denigrating the other. 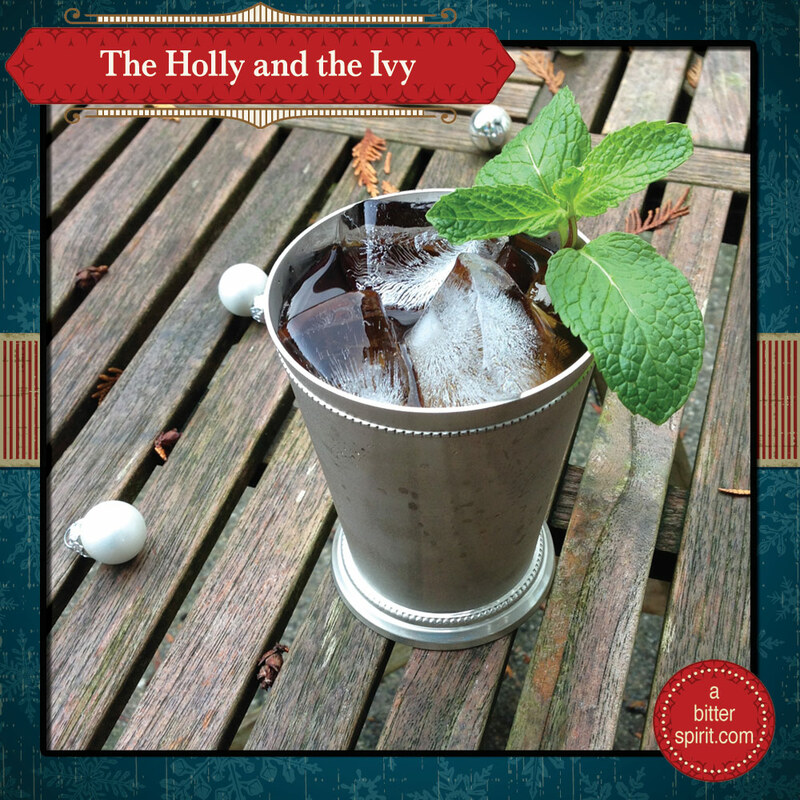 The greenness of the titular plants got us thinking about herbs; we focused on mint and making a julep-type drink for the winter months. So some bourbon, mint and a couple of other liqueurs round out the cocktail. Like the Coventry Carol cocktail, this one can be served either cold or hot. Also worth noting, this cocktail moves us from a week of celebrating the Christ Child to a week of celebrating Mary with cocktails inspired by carols associated with our favourite virgin mother. Place all of the ingredients into a cocktail shaker with ice and stir until chilled. Pour into glass of choice. Add hot water if desired as a hot drink. We made the mint-infused Ferent Branca by placing a generous tablespoon of fresh torn mint into a container with a half cup of Fernet Branca. The infusion should be ready after a day but can sit longer, if desired. We tried infusing some sweet and white vermouth with the mint to test in the cocktail. The mint flavour did not (read DID NOT) go with either vermouth. This cocktail was originally inspired by the Winter Julep cocktail. There's a little skip in the video about 1:45 .. but you can still enjoy Lennox's fantastic performance of this carol. 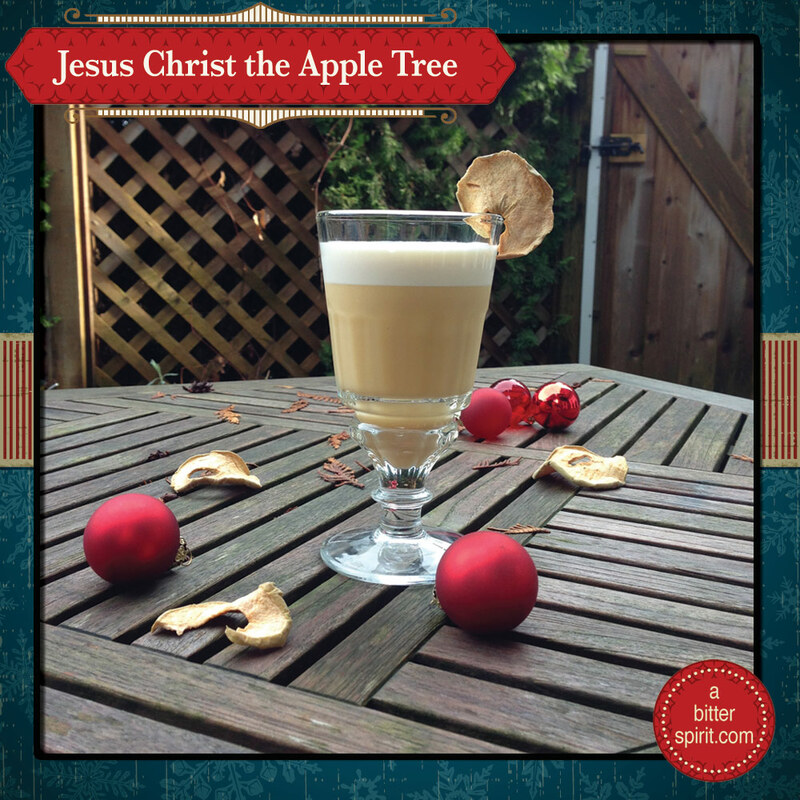 Our cocktail today is inspired by the carol, Jesus Christ the Apple Tree, a hymn that Drew often used to sing in his university choir. There are two origin stories of this carol. One - that it references the apple tree in Song of Solomon which is often interpreted as a metaphor for Christ "As the apple tree among the trees of the wood, so is my beloved among the sons. I sat down under his shadow with great delight, and his fruit was sweet to my taste. He brought me to the banqueting house, and his banner over me was love." The second - that it comes from an attempt to Christianize several English winter season songs that were often used in wassailing the apple orchards. We like the second origin story better. Coarsely chop apple into shaker. Muddle it. Add alcohol to shaker. Shake to combine. No ice. In a clean shaker, add the strained liquid and the egg - no ice. Dry shake for a good long while (listen for a change in viscosity). Once you hear that, add the ice in and continue to shake. Since this is a flip, it will probably take longer to shake than you think it will. When you're making a lot of cocktails there's always one that turns out to be your white whale. It just doesn't usually happen this early in the process. Turns out apple is a tricky flavour profile. At one point we thought, to hell with this, let's just make a Sour Puss Green Apple Martini. But we persevered. First draft: brandy, Apfelkorn and Giffard's Ginger of the Indies. Hmm .. that base ain't right. Is it the ginger? Must be the ginger - ditch the ginger. (Spoiler alert: it wasn't the ginger). Second draft: brandy and Apfelkorn. We need a bitter element. We tried Fernet Branca (No! HELL no!! ); Dubonnet (No - tastes like spoiled vegetables); Suze (better, but you lose the apple so what's the point); B&B (no, terrible). Third draft: bourbon (we used Trace), calvados and Apfelkorn. OK, pretty good base - moving to bourbon was a good idea. Needs some sweet. B&B (no); Tuaca (no). Here's where Drew says "Eff it. I'm muddling an apple." Fourth draft: Muddled apple, bourbon (again, the Trace - it is really smooth), calvados (this is so nice and subtle) and Sortilège (maple to the rescue!). OK, this is a great base. Ditching the Appelkorn was a good idea. Let's finish it with some bitters: Apothecary Smokey Pear (Drew's preference - works well); Apothecary Latin Lime (Kate's preference - brings out the right apple notes); Apothecary General Ambrose (the one we can agree on). And that's how you concoct a cocktail. Oh, if you don't want to muddle an apple, you can try plain fresh apple juice. We did in a 1 part ratio. It was not as apple-y. Fresh ingredients are better, kids. It might taste OK with a double part of apple juice.